Its Not Sinful But You Will Want More Of Bubb’s Grub! If you happen to be from Milwaukee, Wisconsin the name Kuglitsch family meant bowling. Anyone that owned a bowling ball between the 1920’s to the early 2000’s knew them. In the 1980s they also started a thriving catering business. And Dan Kuglitsch ran it with great success. Around 2004, Dan decided he needed a change and headed to Tucson, AZ. And as it happens found and bought the “Hitching Post” restaurant in Catalina. That little community is about 5 miles north of Oro Valley, AZ. For those in Tucson proper, 25 minutes north on Oracle Rd. After buying the Hitching Post the restaurant was remodeled. 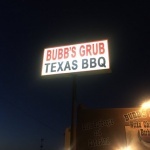 After the remodel the restaurant opened under the big new sign – Bubb’s Grub Texas BBQ. Bubb’s Grub is a down home folksy restaurant with an old west feel. But there is more to the story. How Did Texas Get In The Name? Before opening Bubb’s Grub, the owner/chef/manager had worked in New Braunfels, TX. For the geography challenged, that’s in Central Texas. What you may not know is barbecue in Central Texas is so good it gets rave write-ups in the NY Times and The New Yorker. To put the crown on the king, while in Texas, Dan won the World Championship for his BBQ sauce. This stuff is fantastic. An explosion of smokey flavors combined with the right spices. Pour it on, dip the ribs in it! Lick your fingers. Wipe you face. Then do it again. Alright, if you haven’t guessed by now, this is a favorite spot. Some have said that Bubb’s Grubb BBQ is right up there with the best in KC. Really, Really, Really Good! Seriously Good! Now remember, I mentioned the Kuglitsch family was from Milwaukee, Wisconsin. New Berlin to be exact. And what is a mainstay in Wisconsin restaurants? The Friday fish fry. And guess what? With all the BBQ specialties on the menu at Bubb’s Grub, on Friday nights there is a Wisconsin fish fry to die for. This is an authentic Midwest Fish Fry! The menu is big so order a beverage and take you time. Better yet, take a look – HERE – and find something you crave and head to Bubb’s Grub. And check out the evening specials – NOW! And being from Wisconsin, it won’t surprise you that Sunday football in the bar shows Green Bay Packer games. And if you went to a Big 10 school and want to catch a game this is the place to go. Enjoy the BBQ with all the trimmings and watch a Big 10 game. Taste food, lots of beverages and a great mid-west atmosphere. And it is right here in Tucson, AZ. Its not heaven, its Bubb’s Grub! But damn close to heaven for BBQ lovers in the greater Tucson area. 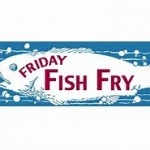 Oh, and Friday night fish fry lovers, too.